Cats of all shapes and sizes enjoy being outdoors. However, in order for both the cat and local wildlife to be safe, it’s best if your cat is on a leash and harness, and supervised, while outside. While harnesses come in various sizes, they don’t always get large enough for a chubby kitty, but that’s okay, there are many options for making your own harness. If you’d prefer an option that does not require you to make something, consider purchasing a harness designed for a small or medium-sized dog instead. 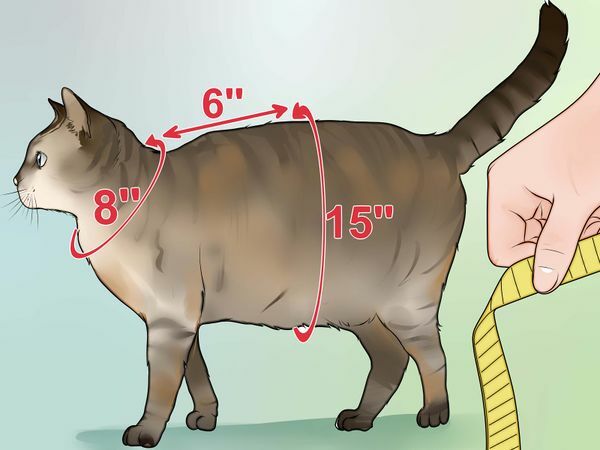 Measure your cat in three places: the circumference of your cat’s neck, near their shoulders (not near their throat where a collar would go); the length between your cat’s neck to the middle of their rib cage (straight line); the circumference of your cat’s chest around the middle of the rib cage. If you visualize these three measurements, you’ll have two circles (one larger than the other) and a straight line between the two circles. For the sake of our example, let’s assume our three measurements are 8”, 6” and 15”, where 8” and 15” are the two circle circumferences. A cat jacket is essentially a vest for your cat, with a D ring on the back for the leash clip. Instead of a zipper or buttons for closing the vest, as you’d find on the human version, you’ll want to use velcro. Velcro allows for slight changes in your cat’s size, and keeps the vest secured around your cat even if they pull on the leash. You can find and download a cat jacket pattern online, or you can make your own. 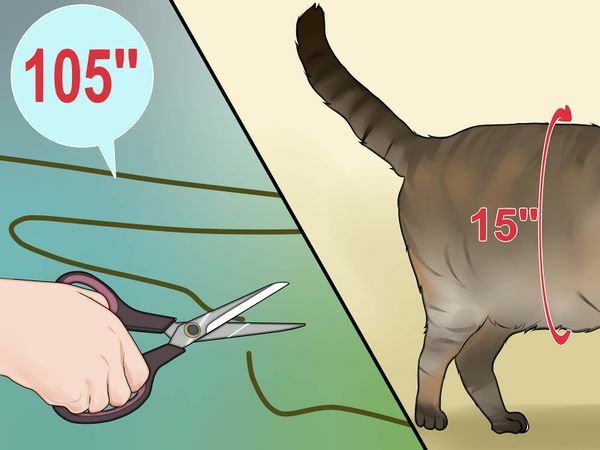 To make your own, you’ll need your cat’s measurements, paper, a pencil, a ruler or measuring tape, and probably an eraser. The cat jacket will be assembled from two parts, but since all the parts are the same size and shape, you’ll only need to draw one pattern. The paper you use will have to be at least as wide as your cat’s larger circle measurement plus a couple of inches, and as tall as your cat’s length measurement plus a couple of inches. In our example, you’ll need a piece of paper at least 17” wide and 8” tall to be certain the pattern will fit on it. Alternatively, you can use two separate pieces of paper taped together. Since you don’t need any special paper to draw a pattern, you could use a piece of a newspaper, the back of a poster, or something similar. 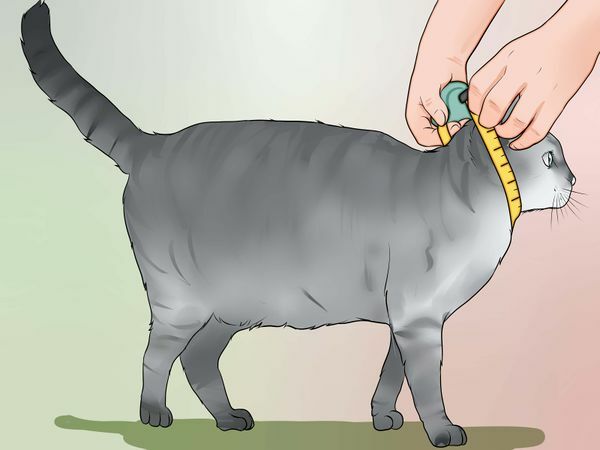 The exact shape and design of the cat jacket can be anything you want, but the important parts to remember is that each section you measured on your cat has to be the same size on the pattern. 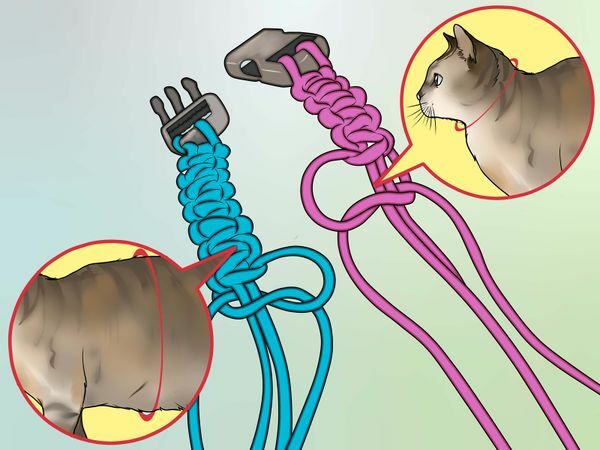 However, since you’ll need to add velcro to the two circles that go around your cat, you’ll need to make sure these flaps overlap each other so both sides of the velcro will touch. EXPERT ADVICEPippa Elliott, a licensedveterinarian, makes a point aboutsafety: "Never cut corners anduse safety pins as fastenings.Not only can these come undoneand hurt the cat, but ifswallowed they can cause seriousbowel problems. "EXPERT ADVICEPippa Elliott, a licensedveterinarian, makes a point aboutsafety: "Never cut corners and usesafety pins as fastenings. Not onlycan these come undone and hurt thecat, but if swallowed they can causeserious bowel problems. "EXPERT ADVICEPippa Elliott, a licensed veterinarian,makes a point about safety: "Never cutcorners and use safety pins as fastenings.Not only can these come undone and hurt thecat, but if swallowed they can cause seriousbowel problems. "EXPERT ADVICEPippa Elliott, a licensed veterinarian, makes a point about safety:"Never cut corners and use safety pins as fastenings. Not only can thesecome undone and hurt the cat, but if swallowed they can cause seriousbowel problems. "EXPERT ADVICEPippa Elliott, a licensed veterinarian, makes a point about safety: "Never cutcorners and use safety pins as fastenings. Not only can these come undone andhurt the cat, but if swallowed they can cause serious bowel problems." 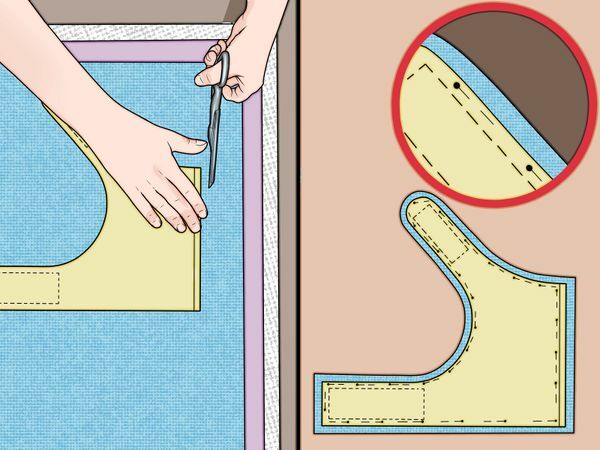 In order to ensure you cut your fabric large enough, you need to add ¼” to the perimeter of your pattern. This ¼” space will be the distance between the very edge of your fabric and where the stitches will be. Once the pattern is complete, cut it out and test it on your cat. If any sections don’t fit, draw a new pattern and try again. 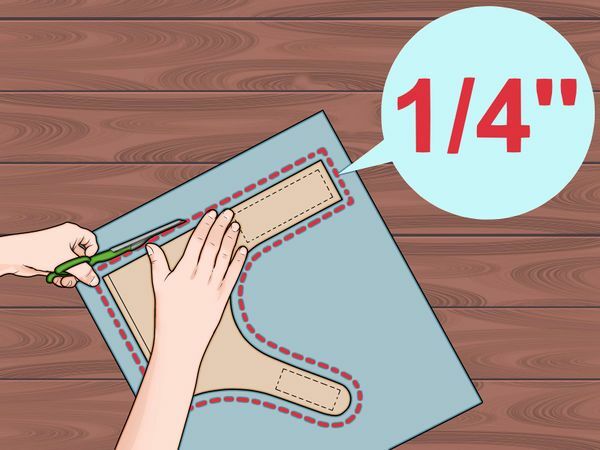 For this jacket you will need to obtain enough fabric (outside) and lining (inside) for the size of the jacket you’re making. You will also require interfacing, nylon webbing, a D ring, thread (in a colour that matches your fabric), and sew-on hook & loop velcro. If you prefer, you can use regular fabric as the lining, in which case you’ll need enough fabric to cut out 2 full sections using the pattern. You can use any type of fabric you want, but you may find lightweight cotton to be the easiest to sew. And it comes in the largest selection of patterns and colours. An alternative to cotton for the outside of the jacket could be polar fleece - which comes in a multitude of colours as well. In this case you might consider a satin-like material for the lining. Interface fabric is normally used to strengthen or thicken another type of fabric. As such it is not a requirement for the jacket unless you feel you need to reinforce the fabric you’re using. If you want to use interfacing, make sure it is the same weight, or less, than the fabric you’re using. If you decide to use cotton, you’ll want to look for standard non-woven interfacing. 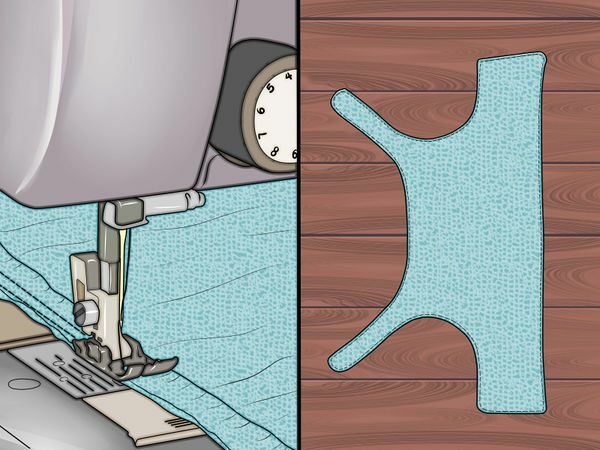 If you’re using polar fleece, which is stretchy, you’ll want to look for knit interfacing. 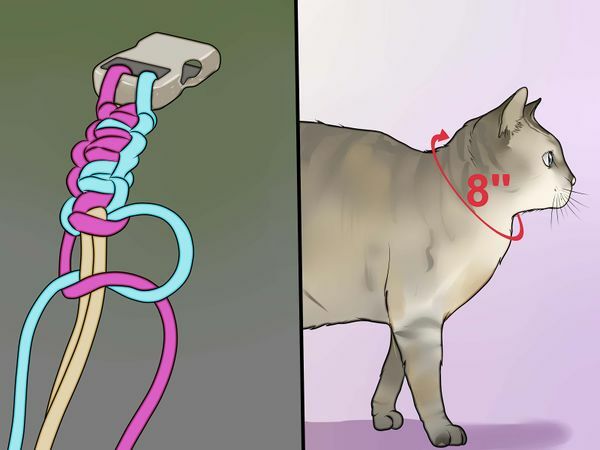 The nylon webbing needs to be at least as long as the middle, straight-line measurement you took of your cat. Ideally you should pick a colour that matches your fabric. The thickness of the webbing is really up to you, based on the look you want, what might match your fabric, and how heavy your cat is. The thicker the webbing, the harder it will be to sew to the jacket using your sewing machine’s “normal” needle. The D ring needs to be at least wide enough to allow the nylon webbing to be placed through it. For example, if you buy a D ring that’s ½” wide, your nylon webbing has to be ½” wide as well, and vice versa. In order to make this cat jacket, you’ll need a sewing machine, iron, measuring tape, scissors and straight pins. You can pick-up a measuring tape, scissors and straight pins at your local sewing/fabric store. 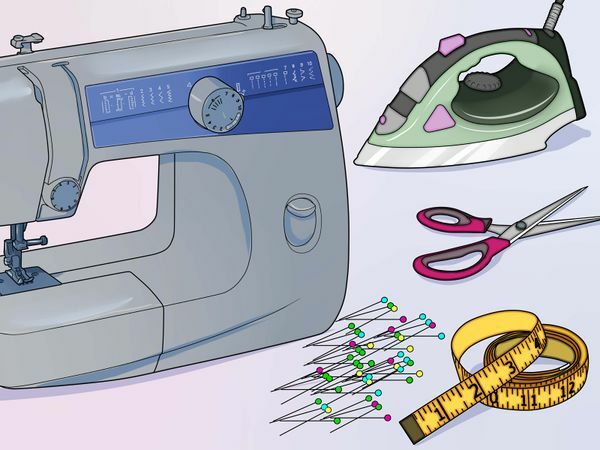 If you do not have either an iron or a sewing machine, consider asking a friend if you can borrow one or both items. You could make the cat jacket using hand sewing and not a sewing machine, if you have no way to obtain a sewing machine. However, it might not be a strong as one made with a sewing machine. Layout your fabric pieces flat on a table, with the grain of the fabric going up and down (i.e. vertical) in front of you. Pin the pattern to the fabric using straight pins. Cut the fabric to be the size of the pattern plus the ¼” seam allowance. As a tip, you can lay your piece of fabric, plus your piece of lining material, plus your interfacing material, all on top of each other and pin the pattern through all three layers. Then when you cut out the shape, you can cut all three pieces in one step. If these three layers are too thick (i.e. the pin can’t easily go through them plus the pattern), you’ll have to do them separately. Remember that when you sew items that have a top and a bottom (in this case an outside and an inside) you sew the items together inside-out. 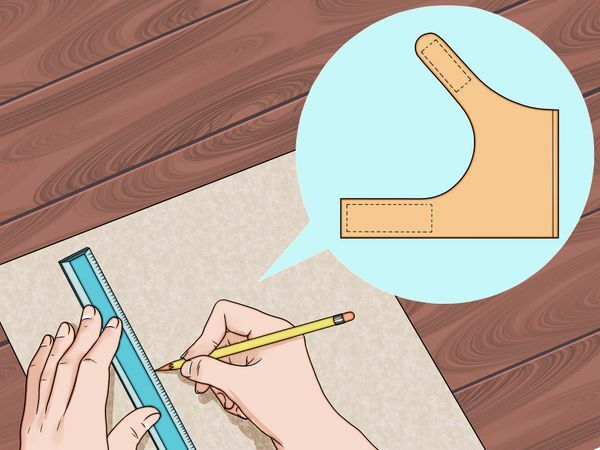 Line up your fabric pieces appropriately and sew the perimeter of the fabric, except for approximately 4” along the neck, which will be used to turn the fabric right-side-out. Once all the pieces are sewn together, and turned them right-side-out, sew the 4” gap closed using hand-stitching. As an alternative to interfacing, you could stuff the inside of the jacket with batting to give it a puffy, down-like look! You could even sew a criss-cross pattern on top of the vest, after it’s completed, to add to the effect. The nylon webbing needs to be sewn to the back of the jacket, where your cat’s spine would be. But before sewing the nylon webbing down, make sure you’ve threaded the D ring through with the rounded edge sticking out. Since you want this part to be strong, use your sewing machine to sew the nylon webbing to the back of the jacket. Note that some nylon webbing can be quite thick. If you’ve decided to use really thick webbing, make sure you have the proper needle in your sewing machine. The velcro is used to fasten the two circles of the jacket around your cat. 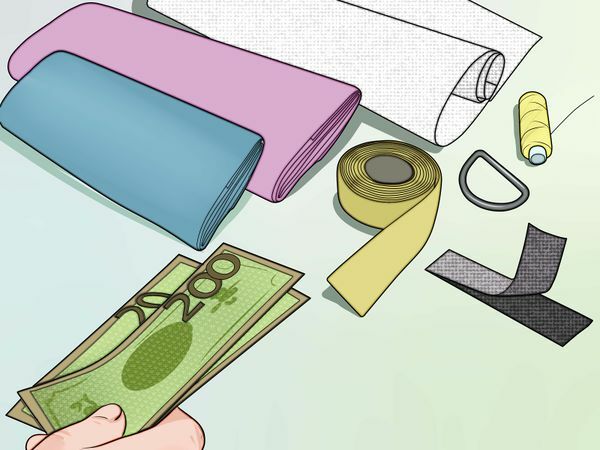 Velcro can be purchased at any sewing/fabric store but for the jacket make sure the velcro is not the adhesive kind. 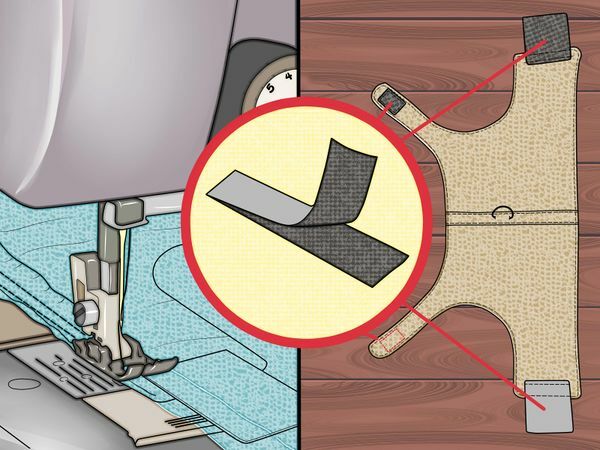 While you could technically sew adhesive velcro onto the jacket, the adhesive itself can get onto your needle and ruin the inner workings of your sewing machine. Remember that when the two sets of flaps go around your cat, they’re going to overlap each other. So one piece of velcro needs to be on the inside of a flap and the other piece needs to be on the outside of a flap. If you’re an experienced seamstress, you could use some other type of closure other than velcro - buttons, a zipper, hooks, etc. Make sure it’s velcroed securely, but that you’re still able to slide 2 fingers underneath each circle. Have your cat wear the harness around the house for a while to get use to it, and show it off to everyone. When ready, clip a leash to the D ring and take your cat outside for some sunshine and fresh air! Not all cats are going to tolerate a jacket or harness right away. There are methods you can use to help train your cat to wear a harness, but beware of your cat’s limits. If these training methods don’t appear to be working, or your cat is really stressed and upset, you should stop and consult a veterinarian before continuing. Let your cat get to know the jacket. Put it down for them and let them sniff it. Give them treats while you do this. Associate positive things (like treats) with the harness so they aren’t scared. Lay the jacket over your cat, but don’t connect the velcro pieces. Feed them treats at the same time to keep them in a good mood. Do this a few times until they don’t appear overly nervous. After they’re use to the feel of something on their back, put the harness on and connect the velcro pieces. Again, do this while giving them treats and praising them. Some cats might simply walk around like nothing happened, others might try to fight the jacket or pretend like they can’t move. Leave the harness on for a little while, or until your cat is too upset. 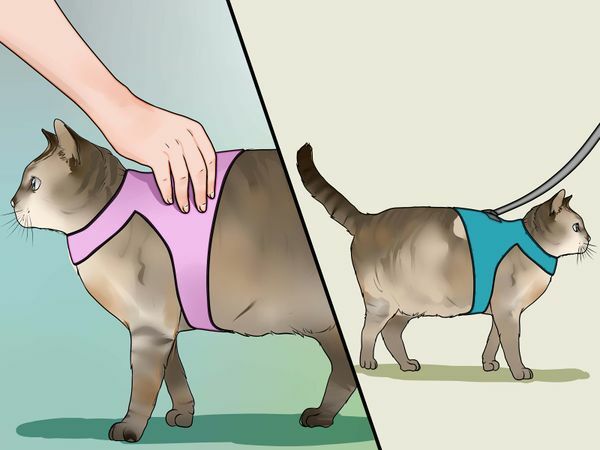 Repeat this several times, increasing the length of time your cat wears the harness. When you feel you cat is ready, attach the leash, carry him/her outside, and let them walk around. Always supervise your cat while they’re outside. 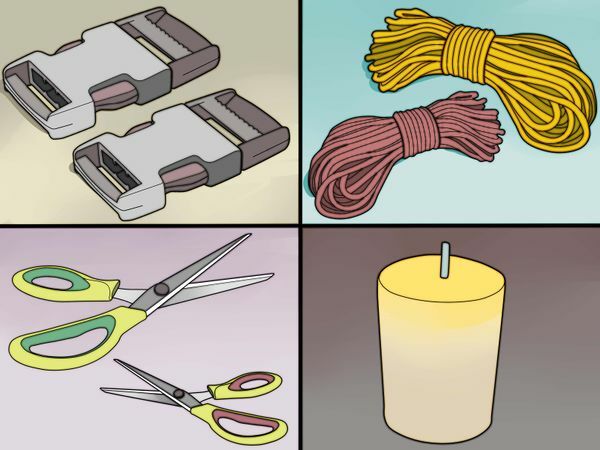 For a paracord harness you’ll need 2 plastic buckles, several packages of paracord, scissors and a candle. For our example measurements, we’ll need at least 203” of paracord. The plastic buckles should be the type that is called a “side release” buckle. An example of what one would look like can be found . Because of the amount of paracord taken up by the stitching/knotting, you’ll want to cut a piece of cord that’s 7 times the length you need. In this case you need 15” for the finished circle, so you’ll want a piece of cord that’s 105” long. 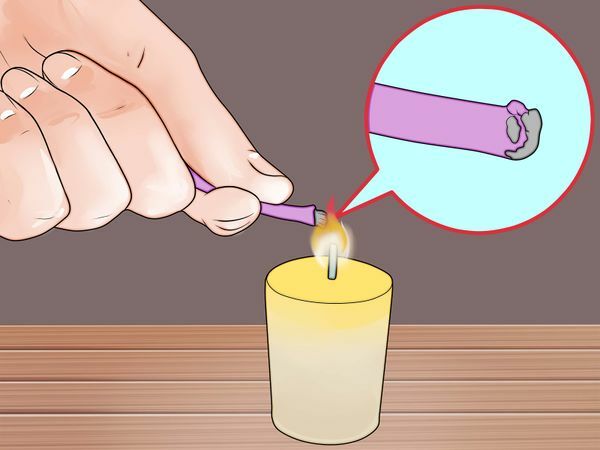 Light the candle and put each tip or end of the paracord into the flame to melt it enough to form a solid seal - sort of like the ends of a shoelace. Melting and fusing the ends will make sure the paracord doesn’t start to fray or unwind in the future. 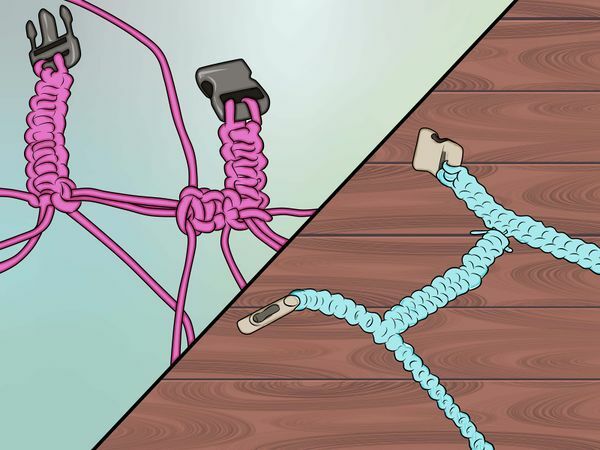 Do not fuse or melt two ends of a piece of paracord together. 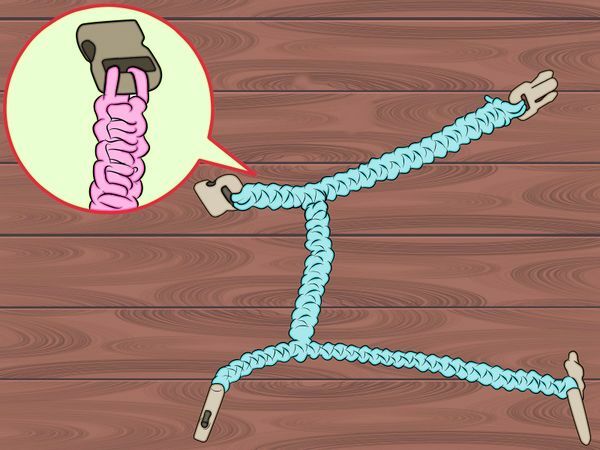 Fold the paracord piece exactly in half (now you’ll have 52.5” of paracord). Attach one side of the buckle to the end of the paracord that’s folded (i.e. not the end that’s in two pieces) by bringing the looped end of the paracord through the buckle attachment by about 1.5-2”, then threading the two loose ends through the loop and pulling tight. Starting at the end where you attached the buckle, use the cobra stitch until you get about ¼ of the way through the 52.5” length. For a step-by-step video on how to complete a cobra stitch, see . For this example, the shoulder circle is 8” around so we’ll need a 56” length of paracord. 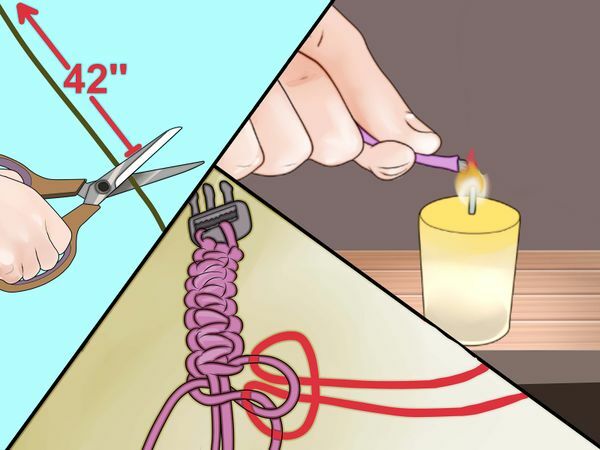 Fuse both ends of the new piece of paracord using the candle. Fold the 56” long piece of paracord in half (28”). Attach the second plastic buckle to the looped end of the paracord piece. Knot the paracord using the cobra stitch until you’re about ¼ of the way through the 28” length. 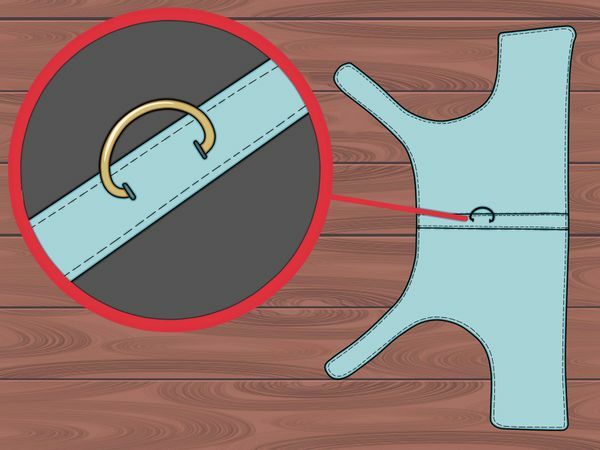 Place the shoulder circle on the table in front of you to the right. Then place the ribcage circle on the table in front of your on the left. Make sure you can see all 4 pieces of loose paracord coming out of both partially stitched pieces. Loosen the left loop from the last stitch on the shoulder circle, and the right loop on the last stitch of the rib cage circle. This section is suppose to be 6” long when complete. Multiplied by 7 means you’ll want to cut a length of paracord that’s 42” long. Fuse both ends of the new piece using the candle. 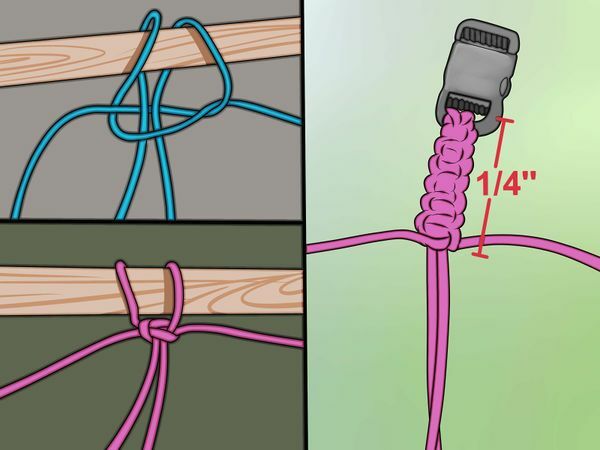 Fold the 42” length of paracord in half so it’s 21” long. Using the same method as when you attached the previous paracord pieces to the buckle, attach the looped end of this piece to the loosened loop on the shoulder circle. Stitch the entire length of this section of paracord. Do not stop at the ¼ way mark. Attach the end of this section to the rib cage circle where you loosened the loop. Using the remaining paracord for both circles, finish knotting them using the cobra stitch. Attach the remaining parts of both buckles to the ends of the paracord circles. Put the harness on your cat to test out the fit. Allow your cat to get use to his or her new harness and then take them outside for some fresh air. 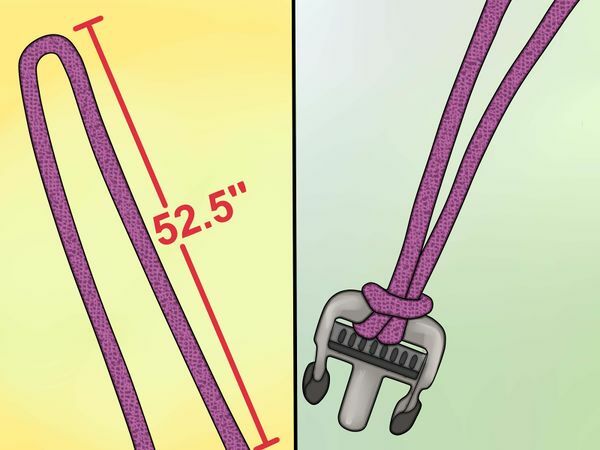 You can attach a leash clip directly to the paracord in the middle section, or you could attach a D ring to the middle section while you’re doing the cobra stitch.